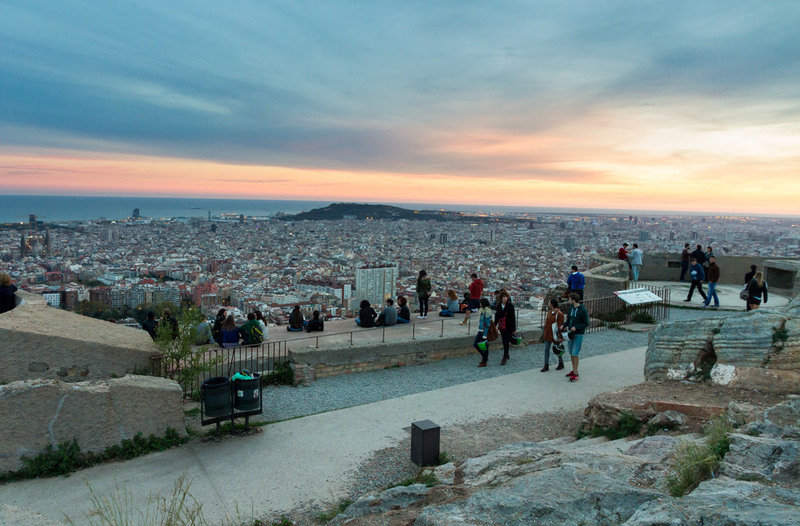 Barcelona is packed with places to enjoy a panoramic view of the city. Here’s a list of some of our favourites that offer the best views without breaking the bank. Can you visit them all? Tibidabo is located on Serra de Collserola mountain range – the highest mountains in Barcelona standing 512 meters high. 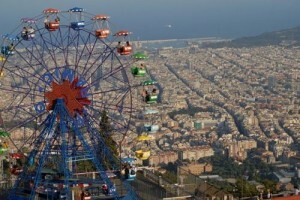 Here, you’ll find the Tibidabo Amusement Park, restaurant Mirablau, and the Sagrat Cor church. If you look for it, the church is illuminated at night and can be seen from all over the city. Tibidabo will take your breath away, and no matter when you go and visit, it’s definitely worth the trip. The base of the mountain is easily accessible by public transportation. If you’re not up for a hike, don’t worry, as there’s a funicular train that will do the work for you. We recommend the Touristic bus T2A from Plaça Catalunya. Only €3 for a single ride that takes 25 minutes to get to the top! Tip: If you’ve already made the 512-meter trip, what’s 15 more meters? Check out the Ferris wheel at the top of the mountain. It’s a truly unique experience on one of the world’s oldest Ferris wheels. Montjuïc hill offers another breathtaking view in Barcelona. Montjuïc Castle rests atop the hill, from which point you can see row after row of Barcelona’s sprawling rooftops. 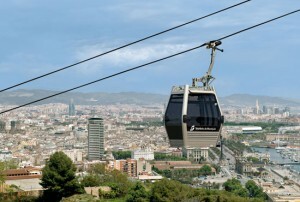 If you want to make a day of it, you can hop on a cable car from Barceloneta Beach that will take you to the top of the hill. Enjoy the cityscape as you ride and prepare for the view. Also, the front balconies of the MNAC (Museu Nacional d’Art de Catalunya) face the Montjuïc Magic Fountains, Plaça Espanya and the Serra de Collserola mountain range. Tip: During the weekend, grab a seat on the stairs in front of MNAC for the Montjuïc Magic Fountain show. The spectacular display is accompanied by lights, lasers and music. You don’t want to miss it! 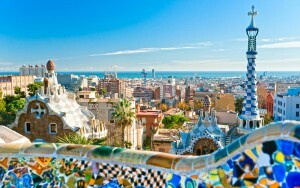 Park Güell is famous for its beautiful panoramic views and Gaudí’s architectural masterpieces. Take a seat on the mosaic-patterned benches at Plaça de la Natura and breath in the cityscape. In the foreground, you can see some of Gaudí’s colorful and quirky creations. In the background, you’ll catch a glimpse of the Sagrada Família (which is next on our list!). Tip: Head there early in the morning when the atmosphere is more peaceful. Park Guëll is one of the city’s most popular tourist attractions, so it’s likely to get crowded. Also, consider exploring the park rather than sticking to just one area! There’s so much to see. If we were to name the number one reason that Barcelona is so proud of Gaudí, it would undoubtedly be (although not limited to) the Sagrada Família! This breathtaking structure is another one of his masterpieces that offers a stunning view of city. In the Sagrada Família, you can choose between stairs or an elevator to access the famous towers of the church, and enjoy endless vistas of the land and sea. Tip: Buy your ticket online to avoid queues, as it can get super busy! Here we have possibly the most unknown but, in our opinion, Barcelona’s most breathtaking view: the Bunker del Carmel (or Turó de la Rovira to give it its proper name). This site is an old military base that was originally built during the Spanish Civil War (1936-1939) to spot and fend off enemy airplanes during the Franco regime. After the Civil War, the spot briefly served as a residential community called the Cannonry. 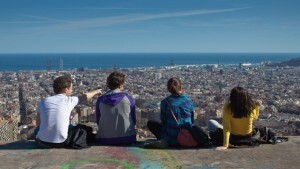 It is one of very few places that has a 360-degree view over Barcelona. To get to the top you can take the metro, however this will require a long walk up to the top. There are many buses including lines 24, V17, 92 and 119 that will take you close to the top so that you don’t have to walk as far. Tip: Arrive at Bunker del Carmel before sunset begins. You will see the most beautiful colours in the sky and the awakening of the city lights. Plus, bring some food, drinks and especially some good friends with you to enjoy the spectacular views. Poble Espanyol is a wonderfully artistic open-air museum/village that also offers a beautiful view of Barcelona. The village was built in 1929 and consists of many architectural features from different regions of Spain, such as Aragón and Andalucía. As a bonus: the view contains the Collserola Mountain range in the distance. Tip: Poble Espanyol is loved among the tourists and can often get very crowded. We recommend you buy tickets in advance and bring some spending money for the neat little artisan shops inside. 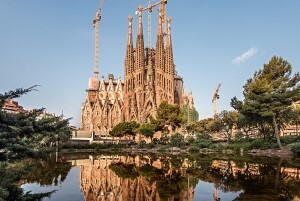 This entry was posted in Home, Things to do, Useful Information and tagged areas in barcelona, barcelona architecture, barcelona tourist guide, barcelona viewpoints, best views barcelona, things to do in barcelona, visiting barcelona. Bookmark the permalink.